Based on years of positive feedback, customers prefer this squirrel-resistant, metal feeder for standing strong in the face of squirrels. The weight-activated perch shuts off the seed supply at a touch of a squirrel’s weight. 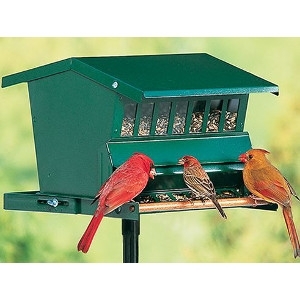 Feeder comes with a Five-Year Manufacturer's Guarantee. Includes two mounting options: hang or pole-mount. This is a 1 inch round sectional pole with a plastic mounting bracket and plastic ground socket. Pole stands 58 inches tall before insertion into the ground. All-steel with speckled green finish and locking roof. 12 x 13 x 9-1/2 inches.